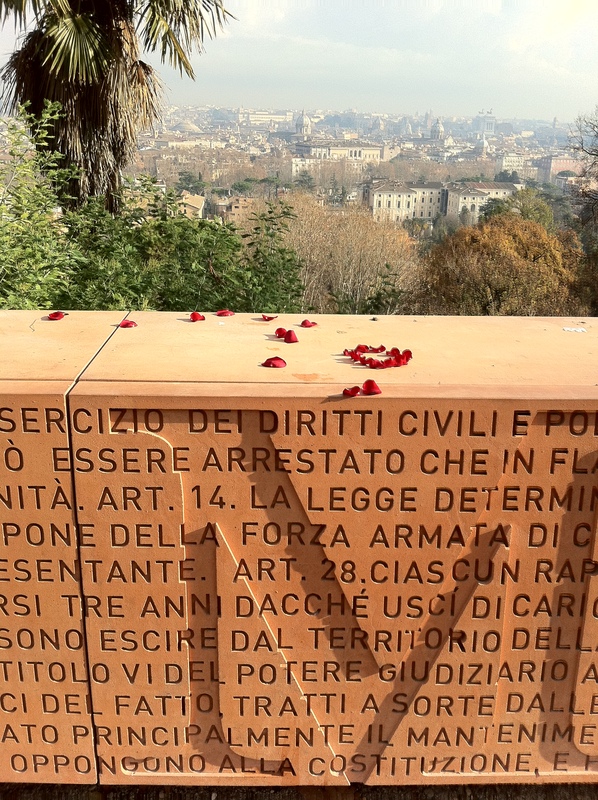 In Rome, Italy, on the Janiculum Hill overlooking the city, stands the Constitution Wall by Annalaura Spalla. This symbol of liberty - a tribute to Italian history, has inscribed in perfect detail; the entire 1849 Constitution of the Roman Republic. 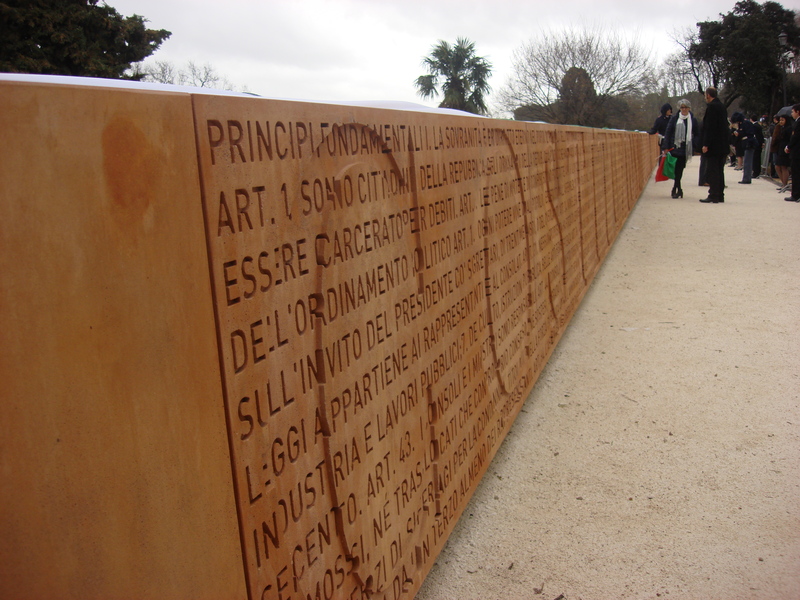 Like the pages of an oversized book, the 50 meter wall constructed in Ductal® UHPC must be skimmed along its entire length to be read in its entirety. 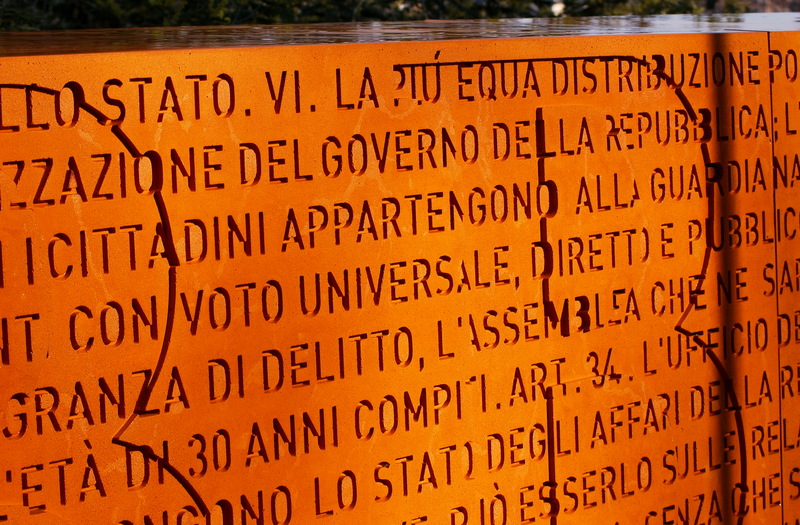 To be seen and touched, the Constitution wall is characterized by its fine details. The Ductal® panels (with organic fibres) are directly attached to the existing wall. 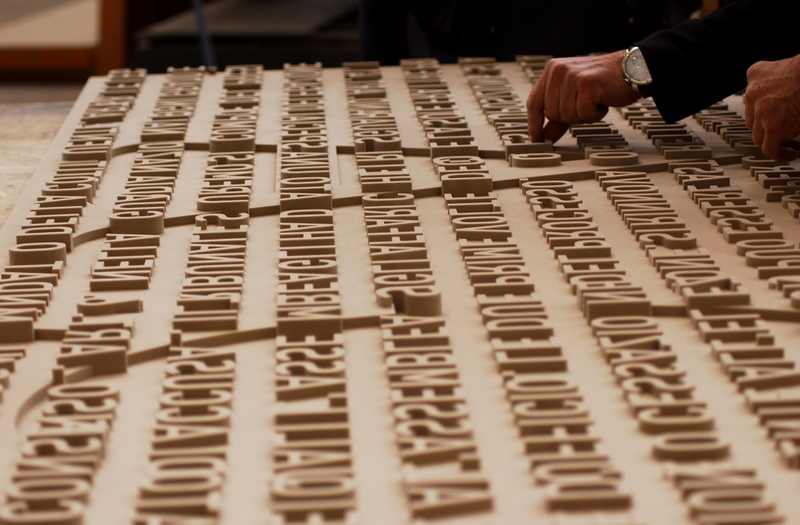 More than 10,000 letters of varying depths, from 1 to 2 cm, transcribe the 69 articles of the Constitution. Originally conceived in conventional reinforced concrete, Ductal® UHPC allowed the creation of thinner panels (9 cm vs 20 cm) with a slender upper section (4 cm vs 20 cm). By comparison to the reinforced concrete solution, Ductal® enabled reduced panel weight and number of connections (attached to a metal structure). 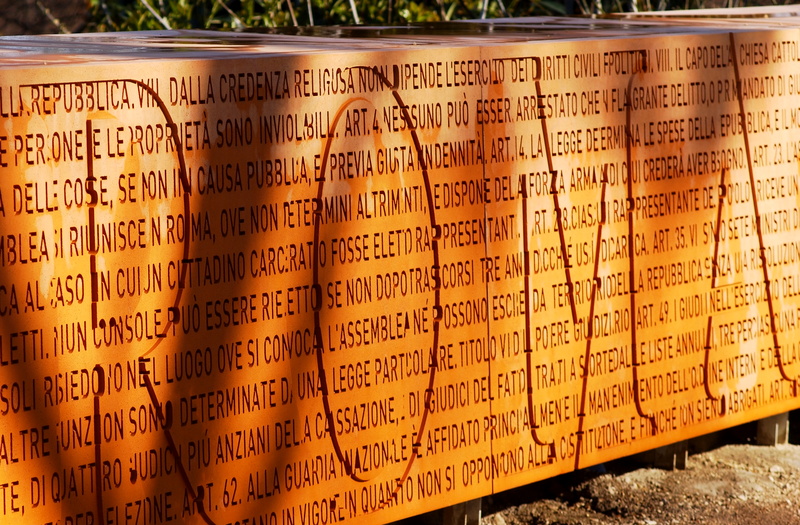 Electricity has been incorporated into the wall, hidden behind the panels, providing a back-light to reveal the letters at night. In addition to its mechanical performances, the Ductal® panels were colored with a red pigment, to blend harmoniously with the magnificent panoramic views over the roofs of the city. 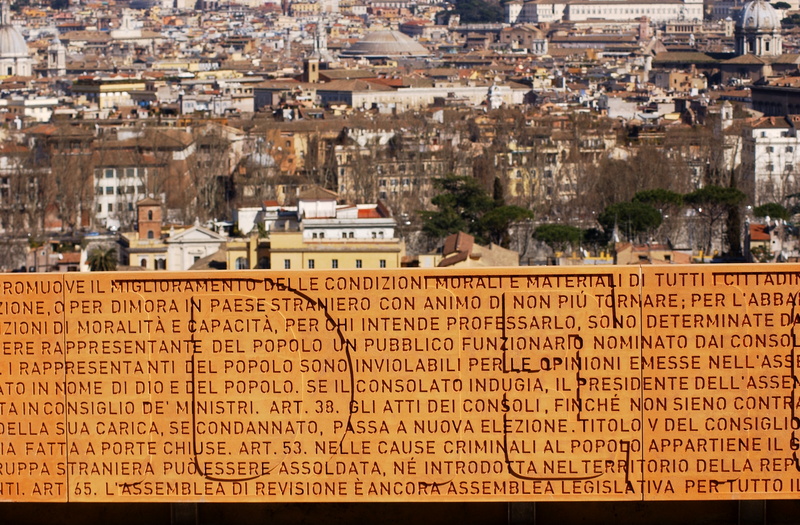 The wall, a symbol of Italian history, was inaugurated in March 2011 by officials, as part of the country's the 150th anniversary of Italy's unification as a single state. 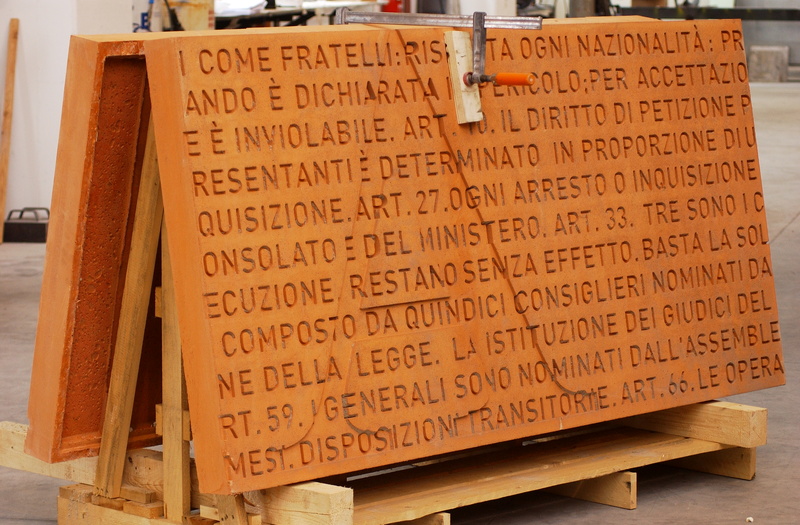 An action promoted by Italian Council of Ministers presidency as part of program called "The places of memory".